Albany - located about 150 miles north of New York City and just south of the Mohawk River - it is the capital of New York State and the economic center of New York's capital district. 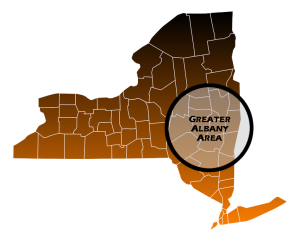 While Albany itself has a population of a little under 100,000, the Albany-Schenectady-Troy Metropolitan Area contains about 1.1 million people in total. Albany was one of the first cities to have modern infrastructure and utilities. In recent years, it has become a hotbed for developments in nanotechnology. I-87, also known as the Northway, provides easy access to Canada by way of Albany. Whether you're driving within the country or internationally, it's important to have quality car insurance. Albany auto insurance is a state requirement and getting caught without it could prove costly. If you need a free Albany car insurance quote, contact Capital Gate Insurance today. Capital Gate connects with insurers throughout the Albany area to get you the best rates for your Albany auto insurance quote. If you're not driving, the Amtrak train system services Albany, as does the Capital District Transportation Authority for bus travel. Albany International Airport provides transportation to people looking to travel throughout the world. Much of Albany nightlife centers around its three "strips": the Pearl Street Strip downtown, the Lark Street Strip just past the business district and the Midtown Strip, which is popular with college students. For outdoor recreation activities, many people in Albany enjoy Washington Park, which offers ice skating, sports and plenty of festivals throughout the year. Living in the capital, enjoying the Adirondacks and the Lake George area is a must for boating, hiking, and so many other outdoor activities. Capital Gate Insurance can meet your insurance needs for any occasion, auto, home, commercial, or life insurance. Contact our agents today! If you're the true outdoorsy type, before mounting your specialty vehicle, make sure you have the right insurance. Capital Gate Insurance group offers ATV, motorcycle and even Albany snowmobile insurance options at reasonable rates. Albany is also popular with boating enthusiasts who make use of the New York State Barge Canal, the Hudson River or the many lakes we have in our area. Lake George, Saratoga Lake, and the Great Sacandaga, contact Capital Gate for the best premiums on Albany boat insurance today. Albany is a bustling, vibrant city and can be a great place to live. If you're planning on living in Albany, contact Capital Gate for a home insurance quote to make sure you can get complete protection for your home at a rate you can afford. We can also find more than just traditional Albany home insurance for your needs. If you're planning on renting an apartment or home in Albany, we can help you find the right Albany renters insurance plan as well. And while you're at it, ask us about our affordable and flexible Albany life insurance plans to fully protect your family in case the unexpected happens. Albany is a hotspot for tech jobs and businesses today, although healthcare, government, and education are also big business. If you have a company in Albany, you want to be sure you have the right Albany business insurance to protect your assets. Capital Gate can help you find the right Albany commercial insurance, so contact us for a free Albany business insurance quote today.